Founded by Thomas Liggio in 1928 Consolidated continues to be the leader for plumbing and heating supplies in Westchester County four generations later. Consolidated’s extensive product offering include the top companies in their respected fields such as Burnham and Lochinvar boilers, Vanico vanities, and many more. Consolidated Plumbing Supply also holds the distinction of being Westchester’s oldest Kohler distibutor with a cutting edge showroom that features many fully functioning displays. 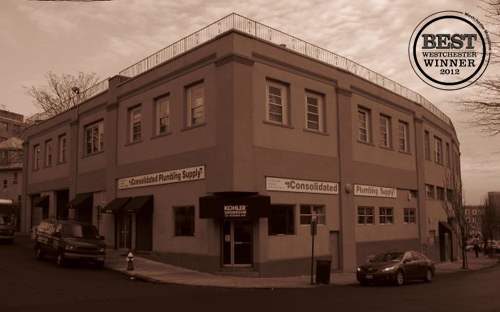 From its humble beginnings as an installer of gas pipe, to the first supply house featuring a showroom, Consolidated Plumbing Supply has grown into the oldest and most trusted plumbing and heating supplier in Westchester County. Family owned and operated since 1928 Consolidated continues a tradition of best in class service with industry leading products.